Whenever I buy outdoor plants, I read the information tag that describes the plant's ideal growing conditions, sun/shade tolerance, temperature range, moisture requirements. 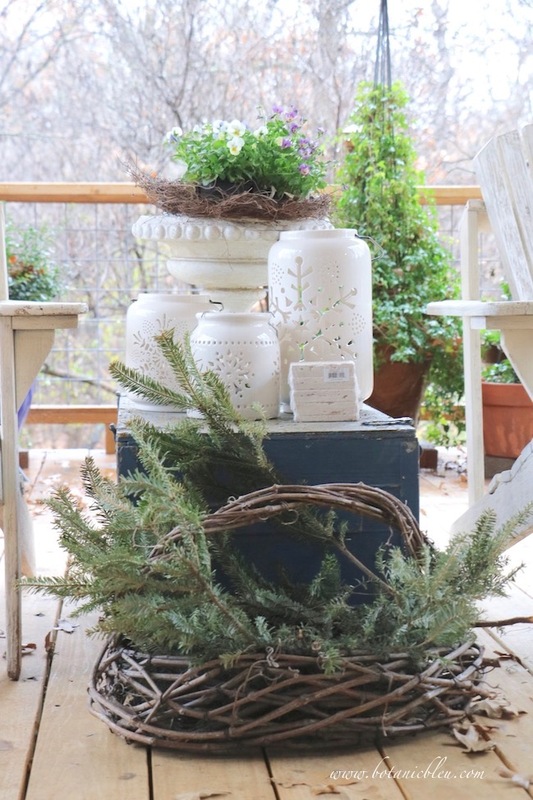 Plants that match the porch's growing conditions year round are potted dwarf yaupon holly shrubs, an ivy topiary, and flowers in clay pots. Most of the flowers are either annuals that die or perennials that go dormant during the winter. Last winter was very mild, and a blue sage plant survived to bloom again in the spring, summer, and fall. One severe winter with many ice/snow storms and prolonged freezing temperatures, I lost an ivy that covered the entire topiary wire form. The ivy topiary growing on the porch now is less than eight years old, began in a 6" plastic pot, and was transplanted to larger pots a couple of times. When the ivy's tendrils had multiplied and grown long, the plant was moved to the topiary pot. Can we agree 13° is cold, regardless of where you live? But, take a look at the violas (Johnny Jump-Ups) in the pedestal urn. Here on the porch, the violas are still blooming after enduring four or five nights of temperatures below freezing, including the 13° night. Even more remarkable is the fact these plants are still in the 4" starter pots, not protected by a larger amount of soil. 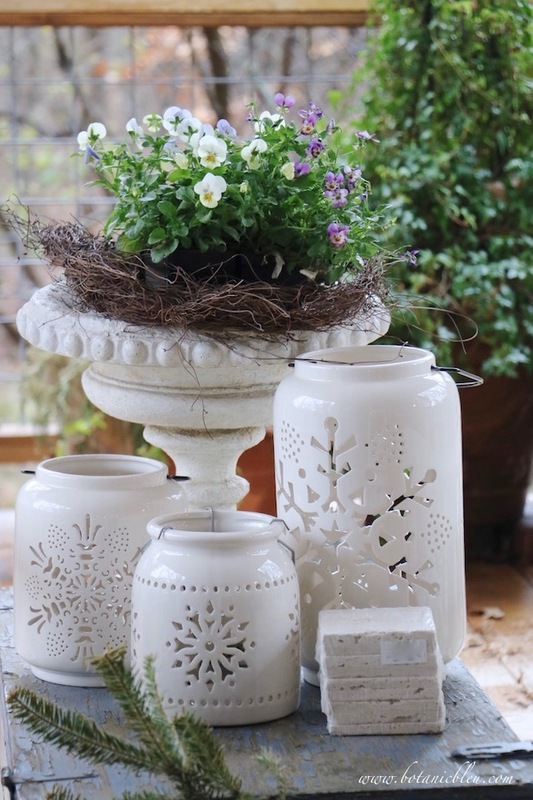 After struggling to get the potted plants to fit inside the urn, I placed a clear pie plate in the urn, set the pots on it, and added the wild wispy angel vine around them to hide the plastic pots. 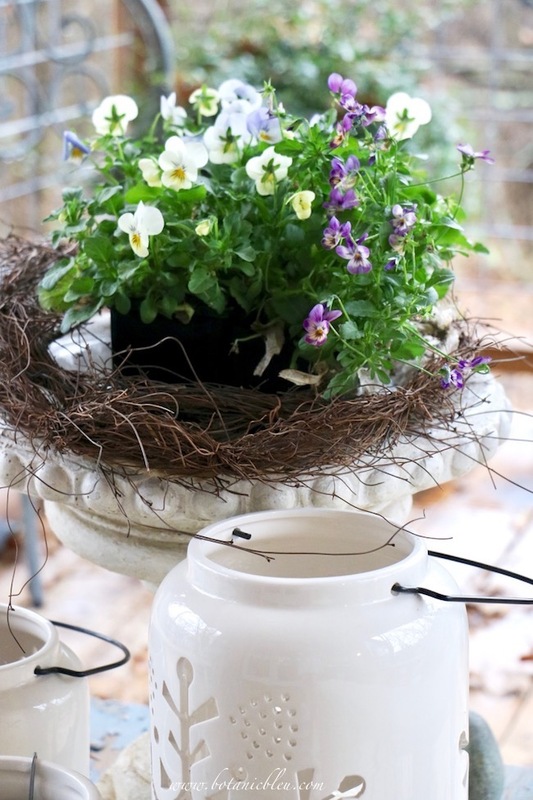 Most years I plant violas and pansies in the clay pots that hold warm weather annuals until late fall. Pansies and violas are amazing! 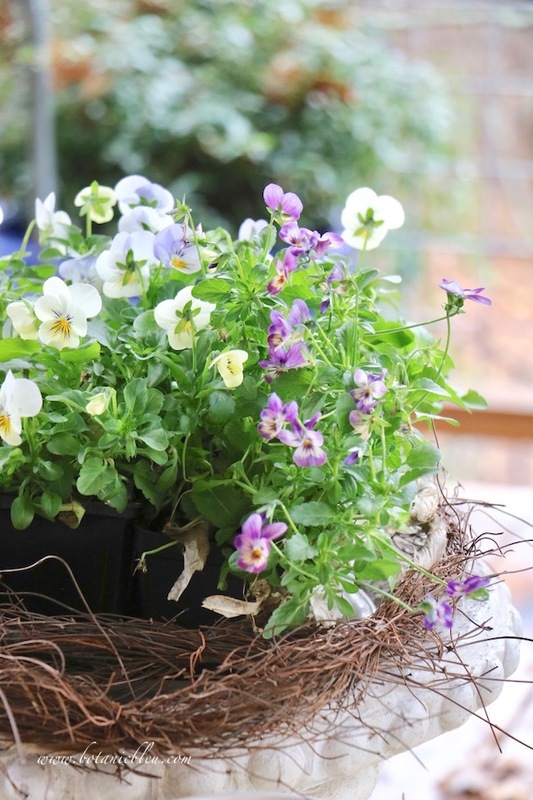 When the weather brings snow or ice, pansies and violas perk back up when the weather warms up and the snow/ice melts. Of course, wintry precipitation in our area does not last for many days. 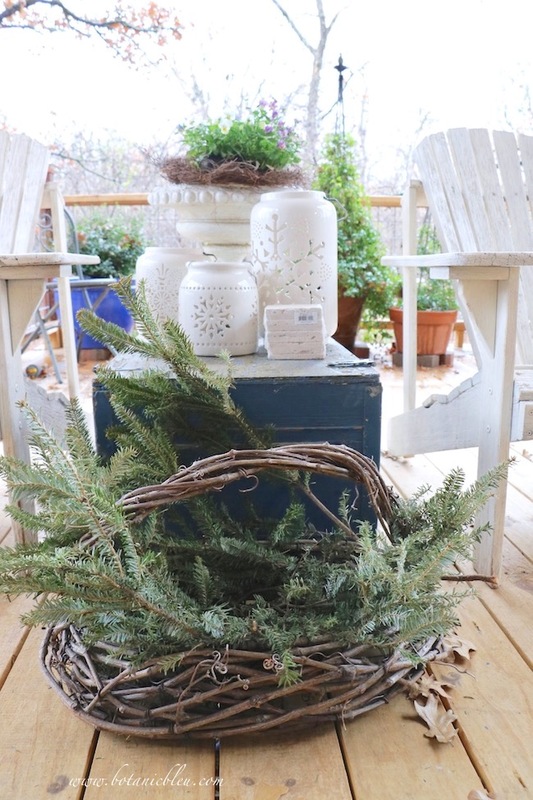 To add more greenery to the porch this year, I filled a rustic vine basket with branches clipped from Christmas trees. Spent paperwhites lie atop another bed of Christmas tree branches so they can be enjoyed a few more days after blooming. When paperwhites are forced inside to bloom in water the bulbs do not gain nutrients needed for future blooms. After the plants have finished blooming plant growers recommend discarding the bulbs instead of planting to bloom in future years. 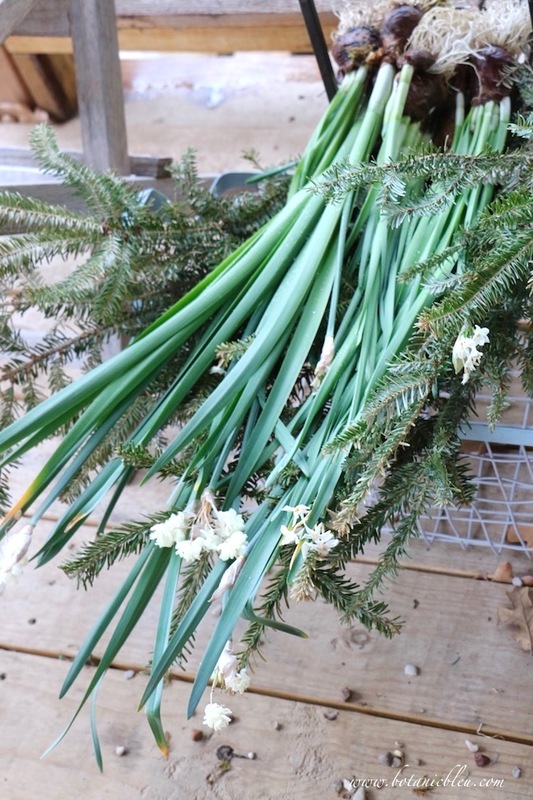 Angelina at Petit Haus wrote a good summary for What To Do With Your Paperwhites After They Bloom. 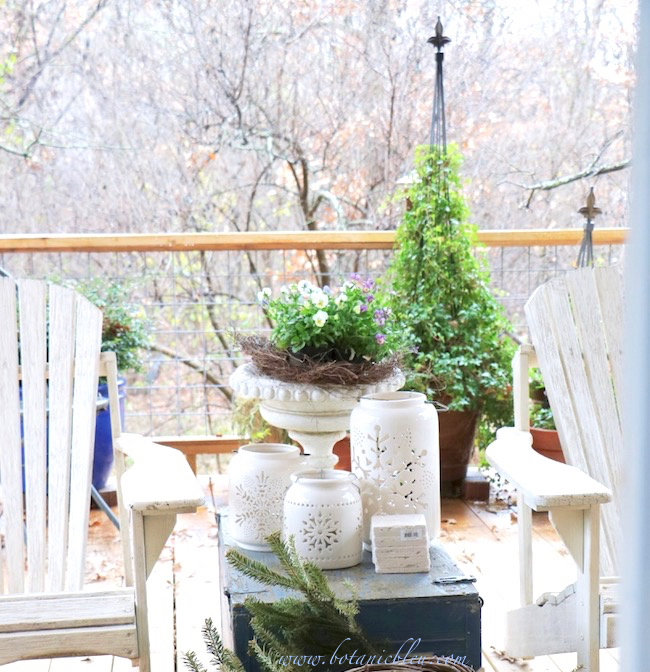 What plants do you enjoy on your porch or deck in the winter? Oh, Judith my plants are nothing but death and destruction. Except one foxtail fern. I didn’t have to coddle it all summer and it’s the only thing still alive. So I’ll be getting a couple more of those. Thanks for the tips! I love to plant the little Johnny Jump Ups! They have the sweetest faces. I picked up several sets of paper whites on sale and need to get them planted. Thanks for the reminder! Enjoy your porch. Today is a perfect day for porch sitting! How pretty your plants are! We are in Northern Ohio, and on the shore of Lake Erie, so Winter plants are unsustainable in an outdoor environment (unfortunately). This year, however, I brought in some potted plants that were used as tabletop decorations for two events that we hosted this last Summer. Almost all are succulents. Every available place near a sunny window is taken up with the plants, and I really am enjoying them! Usually, I have Poinsettias this time of year, too. Was able to find some pretty purple-red plants, and they always do well for a few months. The only blooming plants I have currently are red geraniums in pots. I save them from year to year, bringing them inside when the night time temperature hovers around freezing. After the cold snap we just had, they are now outside 24/7, until probably later in the week when the temperature is going down again. I do have some brilliant orange/red berries on my Nandina. They really brighten up the garden. Love them! Johnny jump-ups and pansies are so resilient -- I buy them in early spring here in Michigan where spring can go till June at times and they never disappoint. They also go into the fall when watered well. I love using a grapevine wreath as a base for flowers -- yours is so very pretty! I am just in love with your white pots! So pretty. Wonderful, informative and pretty post. Love the white accents. You've given me some wonderful ideas for my balcony. Gorgeous photos. The violas are wonderful. I tried to get paper whites to bloom again but it didn't work for me. I'll head over to the article that you linked. Thanks for linking up to "Keep In Touch". This gives me ideas for sprucing up our garden in this cold month. This is such a gorgeous post! 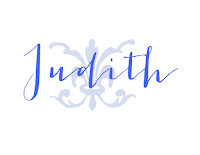 I would love for you to link up at Thursday Favorite Things on my blog. If you can leave a comment with your number I will surely feature this post next Thursday.